Farms Archives - CH Edwards, Inc.
Summer Guide to U-Pick Lewin’s Farm! Summer is here and that only means one thing, fresh summer produce! If you love fresh fruits and vegetables, check out one of Long Island’s many “U-Pick” farms on the east end! With a wide variety of choices ranging from blueberries, raspberries, blackberries, peaches, tomatoes, peppers, eggplants, and more, you and your family are sure to find something you all love! 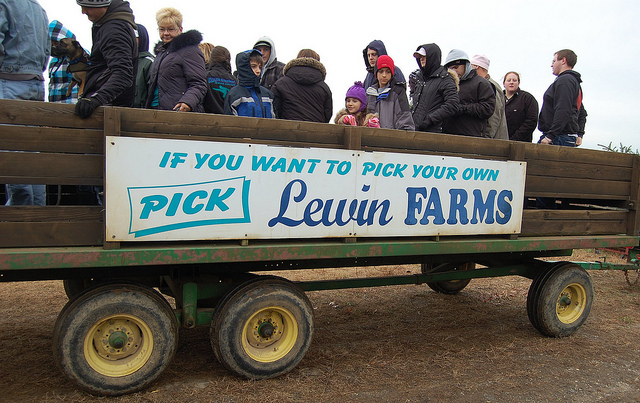 Lewin’s farm on Sound Avenue in Calverton offers many fun, family activities along with their “U-Pick” farm experience. Even if you don’t feel like picking your own produce, Lewin’s offers a huge farm stand of already picked fresh produce right at your fingertips. While there, make sure to take a drive down Sound Avenue and see what other farms and stands can offer you. Its summer fun for the whole family, don’t miss out on this year’s summer picking season. Looking for a twist on your weekend breakfast/brunch? Bring opposite corners of rectangles together and press together to seal. Fall is here and that only means one thing, fresh fall produce! If you love fresh fruit’s and vegetables, check out one of Long Island’s many “U-Pick” farms on the east end! With a wide variety of choices ranging from apples, tomatoes, eggplants and pumpkins to fresh pies, cider, donuts and homemade jams, you and your family are sure to find something you all love! Lewin’s farm on Sound Avenue is Calverton offers many fun, family activities along with their “U-Pick” farm experience. The whole family can enjoy corn mazes, hay rides and much more. Even if you don’t feel like picking your own produce, Lewin’s offers a huge farms tand of already picked fresh produce right at your finger tips. It’s fall fun for the whole family, don’t miss out on this year’s picking season. Fall on Long Island calls for weekends filled with “Farm Fun”. This past weekend was a beautiful weekend to be out on th e east end! Taking a trip “out east” is always a fun way to spend time with loved ones. Not only for your time spent together, but the beautiful scenery you will experience. With so many “U Pick” farms to choose from, you’re sure to find something that you will love! Seven Ponds Orchard, in Water Mill was filled with many Long Island Folks this past Sunday. The weather was perfect to pick apples, pumpkins and corn! In addition to their Apple Trees and Pumpkin Patch, the market was filled with other fresh produce, pies, homemade jams, apple cider, apple cider donuts and even flavored honey sticks! Kids were having a blast too, as they enjoyed the farms corn maze, and a special tractor ride around the farm! With reasonable prices, walking out of the farm with a full bushel of assorted apples, a large pumpkin (for carving of course), five ears of corn, a pint of fresh cider and a handful of honey sticks was a steal! Seven Ponds Orchard is located at 65 Seven Ponds Rd, Water Mill, New York 11976 and is open seven days a week from 9am to 6pm! Enjoy the Fall Season while it lasts! Plan a trip to visit our Long Island farms this weekend! Discover Long Islands East End! Long Island is known for salty beaches and wide open spaces. Many people may not know about the treasures you can discover on the east end of our Island. Small towns and wonderful Bed & Breakfasts are the back drop for a wonderful getaway. A perfect weekend getaway or day trip for Long Islanders is to the east end to visit our beautiful farms. Every season there is something new to pick on our farms. From Pumpkins and apples in the Fall, to Blueberries, Strawberries, vegetables and Lavender in the Summer time. The Vineyards are a “must see” in both Summer and Fall. Fresh baked pies are available year round and for a limited time in the Fall, there’s Apple Cider donuts! Long Islands Farms and attractions are staffed by friendly locals willing to help you achieve the experience you are looking for. Not only is this a fun trip for a weekend but it is also an awesome and interactive way to spend time with your loved ones. Visit www.eastendgetaway.com for a listing of Long Island farms as well as Vineyards, Shows and Attractions, Accommodations and even Dining and Shopping! Take a trip and experience the beauty of Long Island’s East end. Check Out Long Islands East End!